People and groups around the world are increasingly producing their own everyday urbanism: their activities bring incremental improvements to streets, blocks and neighbourhoods through use, small-scale informal urban design and spontaneous interventions of micro-urbanism. Often the results are temporary but they can have a great impact on residential communities. They utilize existing spaces or require minimal investment, infusing places with value and meaning. Often results are temporary but they have a great impact on residential communities, against a small investment, because of their immediate ability to infuse places with value and meaning. Architects, engineers, urban designers and planners, can be part of these processes that link design and top-down planning with bottom-up activism for the common good, looking for commons-based solutions. But it is necessary to change point of view and to establish a new approach to urban design, a new strategy based on people and everyday spaces. 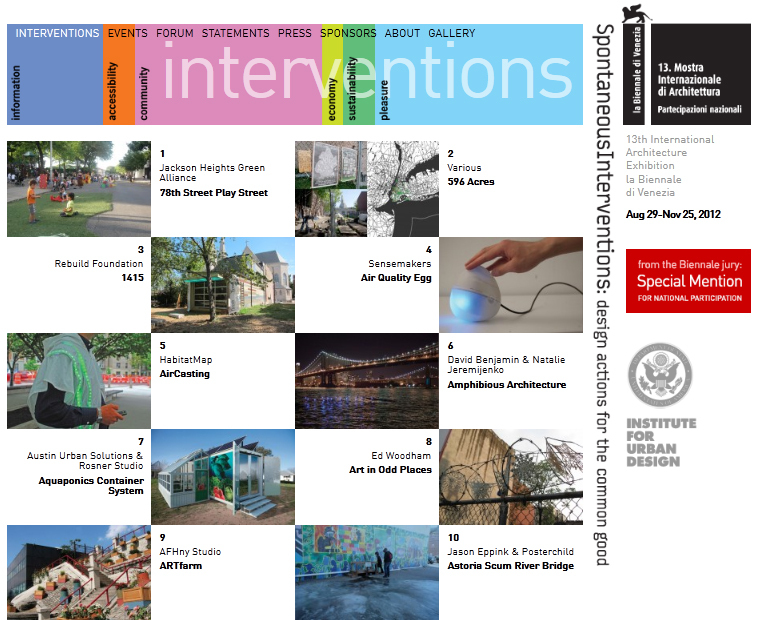 124 projects representing this kind of urban activism or “tactical urbanism” were shown in 2012 at the Venice Biennale, United States of America pavilion, celebrating widespread desires for good places and for the freedom to improve everyday public life. These improvements can take place even when there is no client, no architect and no authority to sanction them. The test of this article is an extract from L. Bravo (our President) and M. Crawford, Publics and their spaces: renewing urbanity in city and suburb, EAEE/ISUF International Conference proceedings, 16-19 ottobre 2012, The Netherlands, New urban configurations, TU Delft, published by IOS Press. The article is available here. The full publication "New Urban Configurations" is available here. Abstract of the book: Urban areas have been caught up in a turbulent process of transformation over the past 50 years and changes have been rapid, with issues such as mobility, nature, water management, energy use and public space featuring prominently. In each Olympic year since 1988, the Faculty of Architecture at Delft University of Technology has held an international conference focusing on the connection between research and design, exploring the field of tension between science, technology and art. This book presents the proceedings of the latest in this series of conferences: New Urban Configurations, held in Delft, the Netherlands, in October 2012 in collaboration with the European Association for Architectural Education (EAAE) and the International Seminar on Urban Form (ISUF). This edition of the conference discussed the role and critical potential of the architectural project in the transformation process of cities and territories that leads to new urban configurations. The publication contains all 140 accepted papers and a selection of the keynote lectures presented at the conference. The papers have been grouped into five main themes: innovation in building typology; infrastructure and the city; complex urban projects; green spaces, and delta urbanism. Four of these major topics are further divided into several subtopics. This book will be of interest to everyone involved in designing, building, thinking about as well as managing the urban landscape and territory. This entry was posted on March 30, 2013 at 4:54 pm. No Responses to "Publics and their spaces"